On his quest to avenge Maya’s death, Tony only has two strains of the Extremis virus left to take out. Tony decides to take the harder mission which has him going deep inside a catacomb requiring him to take down twelve possessed cultists with deadly intentions. With very little wiggle room and a ton of people to go through, Tony decides to implement a new Iron Man suit, one better suited for closed-quarter combat. Kieron Gillen continues to use the one-and-done mission style in this issue and it’s one that really works well for him. Starting with a moral/ethical question asked by himself or Pepper, going on this mission that requires a special suit, and returning home with an answer to the question is a pattern that plays to Gillen’s strengths. Each new suit feels creative has become something I look forward to seeing each issue. I do wonder what the overall plan for this arc is, especially with the final issue in it coming up next month, but I’ve enjoyed what I’ve read so far and Gillen continues to do a good job. I feel like I’m a broken record when it comes to the art in Iron Man. As most who’ve read my previous reviews know, I really don’t like Greg Land’s art style. It feels cold, lifeless and only really works when he’s in the suit blasting bad guys away. The first part of the book, which features Tony talking to Pepper before deciding to go into the catacombs, features some eerie facials that seem better suited for a magazine ad rather than a comic book. What’s worse is I think Pepper’s facials throughout most of the comic have already been used, not just on Pepper but on a majority of the other female characters in the book. We’re four issues in and Greg is already recycling? That’s never a good sign. On top of that there is one scene towards the end of the book that would usually require blood (something suddenly being missing from someones body), but it’s so clean and pure that it looks like it was just photoshopped out after the fact. It’s borderline lazy. That being said, there is some positives in the art, albeit the negatives seem to outweigh the positives. Tony’s new Iron Man suit looks awesome and is really well designed. When he’s moving around in the comic it looks really great and it adds to the level of excitement during the action scenes. On that same note, most of the action, minus the aforementioned photoshopped moment, is really well drawn and feels appropriately claustrophobic. The panel to panel transitions really work well in these scenes and you get a good sense of atmosphere throughout the mission. Iron Man #4 straddles the line of buy/not buy and really depends on how much Greg Land you can take. The story is well written, despite a few issues with explanation or background, and Gillen continues to be the biggest reason you should pick this up. 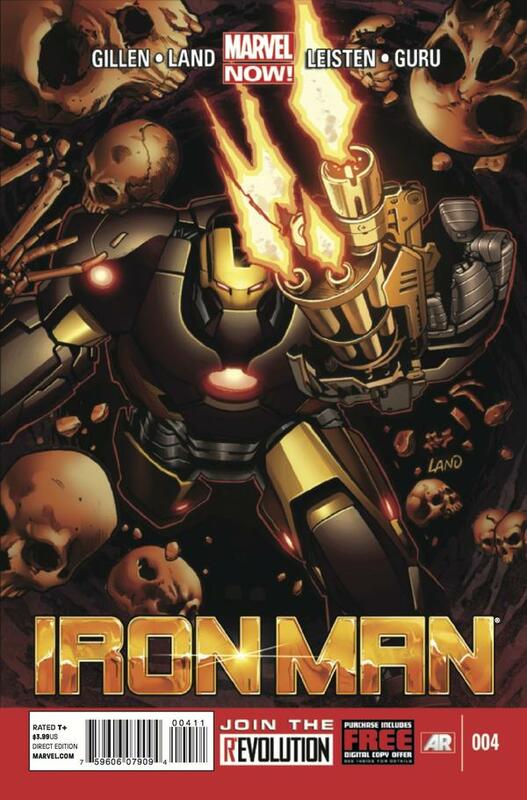 While there have been better Iron Man stories out there, Gillen’s story is very new-reader friendly and the one-and-done story aspect continues to work really well for this comic. With the final issue in the “Believe” arc coming in January, it will be interesting to see how everything comes together in the end. Let’s just hope the art either improves or stays consistent enough that it doesn’t scare me away from buying.